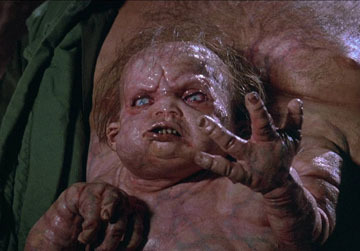 When Kuato Starts Dancing in My Stomach. Or Something. One of the things I hate the most is not being able to write when I want. I get most of my inspiration from music. I guess it’s my muse. And it’s rare for me to go a day without listening to music. (I suppose people at work people probably get concerned when I’m not wearing my headphones.) So when I’m writing, editing or proofing something for the magazine and suddenly I hear a song that makes me want to write my stories, I start to feel like a gremlin is trying to tear out my insides. Like that scene in Total Recall where Kuato busts through George’s stomach. Yeah. Like that. Free the words!! Free the words!!! Maybe that’s what is really going on when my stomach’s growling. It’s Kuato telling me to write. Because if I don’t, he’s going to bust out and demand I free Mars. I should probably force M to watch Total Recall so they can be prepared for the day I must save the world from bad space dudes bent on taking over my mind…’cause they want my stories. Dangerous. Yeah, I seriously daydream about these things. Hey babe. It’s C. Finally got around to commenting you. For some reason my wordpress ID won’t log in here. Weird. It logged me into The Closet fine. anyway…just wanted you to know I’m following you!